The Streissguth house is built into a steep section of Capitol Hill. The Streissguth Gardens include a private garden for the Streissguth family and a public one open to visitors. A Tausendschoen rose outside the Streissguth house began with a cutting from Ann Streissguth’s parents. 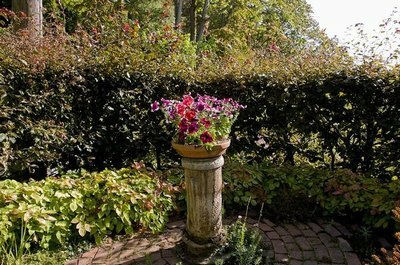 The Streissguth Gardens began when Daniel Streissguth and Ann Roth Pytkowicz fell in love. An architect on the UW faculty, Dan had designed a four-story house for himself on a steep part of Capitol Hill and was creating gardens around it in the 1960s when Ann, a psychologist on the UW medical school faculty and a passionate gardener, moved in next door. Ann and Daniel began gardening together, and in 1968 they married. Two years later, their son, Benjamin, was born, and since then, the three have created a unique urban garden. It’s the subject of their new book from the University of Washington Press: In Love with a Hillside Garden. The Arboretum Foundation will celebrate the book’s publication from 5:30 to 7:30 p.m. on Thursday, Oct. 22, at the Graham Visitors Center in Washington Park Arboretum. Admission to the event and parking are free. 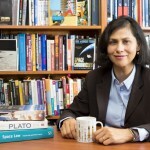 Ann, Daniel and Benjamin will also speak about their book and sign copies at the University Bookstore, 4326 University Way NE, 7 p.m. on Tuesday, Oct. 20. The gardens cover a one-acre parcel on both sides of the East Blaine Street public stairway between Broadway East and 10th Avenue East. The private part of the gardens surrounds the two Streissguth houses. (The couple live in Daniel’s and rent out Ann’s). The public part extends south to the St. Mark’s greenbelt. During their 40 years of gardening together, the Streissguth family has cleared jungles of horsetail, wild blackberry, boggy muck and overgrown trees, then carefully designed, planted, weeded and irrigated to create the gardens. 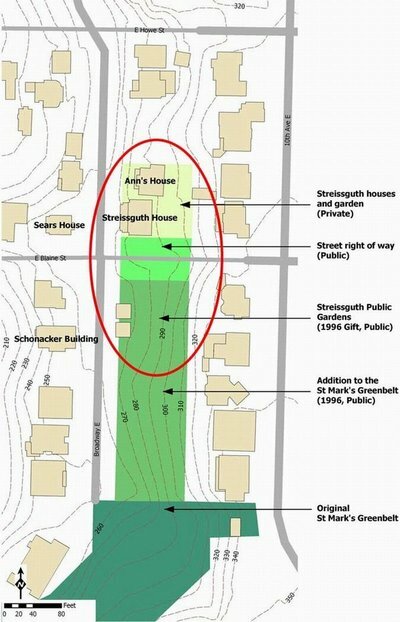 In 1996, Ann, Daniel and Benjamin deeded the gardens south of the East Blaine Street stairs to Seattle’s Department of Parks and Recreation with the understanding that the Streissguths will maintain the gardens for the city as long as they are able. One, a good garden must be in tune with its site, topography, orientation and climate. When Daniel began gardening his parcel in the 1960s, he cleared a portion of the public land on the south side of the sidewalk and planted grass as a friendly public gesture. The real work began, however, when a widowed neighbor asked them to buy her property, which included the two heavily wooded plots. After much soul searching and several trips to a mortgage banker, Ann and Daniel bought the property. Then, little by little, they pushed their gardens southward — and some 40 vertical feet eastward. Ann and Dan’s house includes carports on the ground floor, a rental apartment on the second floor, and their residence on the third and fourth. The third and fourth floors open to private gardens, including a grassy oval that serves as an outdoor dining room and living room overlooking Lake Union and Seattle skyscrapers. When Ben was small, his parents carved a large sand pile in one end of the grassy oval and lugged buckets of sand up the hill. The sand pile has now been filled in and the room extended with Italian cypresses and a tapestry hedge which is actually several forms of copper beech woven together. Four, a good garden demands long-term commitment. 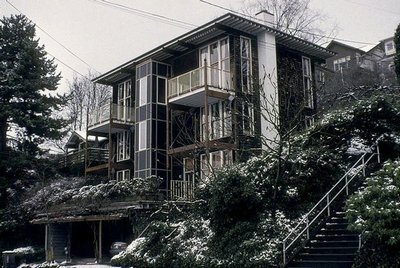 Over time, the Streissguths learned what works and what doesn’t on a steep hilly parcel in the middle of Seattle, so one of the book’s essays is “Plants Who Do Their Share of the Work.” Ann describes the family’s early-and-often use of plants that reproduce with great and sturdy abandon. For example, money plant (Lunaria annua) fever few (Crysanthemum parthenium) and raggedy robin (Lychnis coronaria). He has created an extensive Web site about Streissguth Gardens: http://www.streissguthgardens.com/Welcome.asp. It includes not only the history of the garden and photographs but a searchable database of plants it contains. The plants are listed by both common and botanical names at both the Web site and the end of the book. Both Ann and Daniel come from families of gardeners, and their gardens include memories. 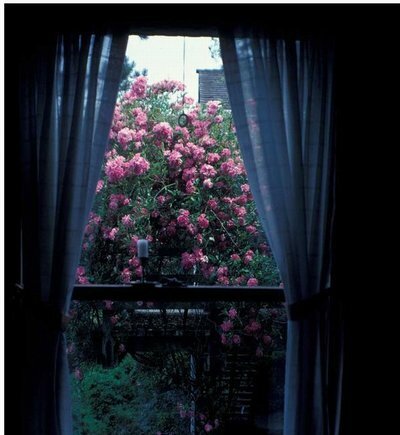 Outside the window of their guest room, for example, is a Tausendschoen rose bush begun with a cutting from Ann’s parents. Also, a Clematis montana vine clambers over a railing between the oval lawn and a fourth-story door to the Streissguth house. It was suggested by vines Ann and Daniel saw during a sabbatical in England. If you visit the gardens, don’t be surprised if you see Ann, Daniel or Benjamin watering, weeding or planting. They often work on both sides of the stairs, stopping to chat with visitors.